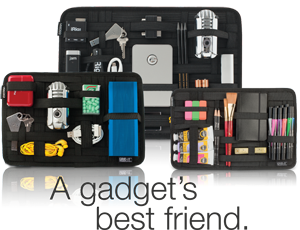 Do you carry your laptop and assorted accessories in your bag? If you’re like me, you carry a power cord, earphones, a USB flash drive, a few cables and adapters, etc. I grew tired of sorting through a pile of accessories trying to find what I needed. I ended up buying a small Cocoon Grid-It which fits into the outer pocket of my laptop’s carrying case. It holds onto my assorted accessories so I can quickly find what I need. Cocoon’s Grid It’s come in a variety of shapes and sizes so find one that works for you. I like the flexibility that they offer since the specific accessories that I carry will vary over time. Read more about accessories, computer, organize.